Longhorn cattle were brought by the Spanish via Mexico into Texas in the sixteenth century. After the Civil War (1861-65) there was an explosive increase in their population. Cattle intended for slaughter were driven slowly along the wide 'cattle trails', often taking two years to reach market in the more densely populated north east. In the extremely hard winter of 1885/86, up to 85% of the animals died in many areas. After the subsequent extremely dry summer and an unusually severe blizzard in January 1887, holdings completely collapsed and the importance of this breed was practically destroyed. In 1964, the Texas Longhorn Breeders Association of America was formed. At that time there were less than 1,500 head of genuine Texas Longhorn cattle in existence. 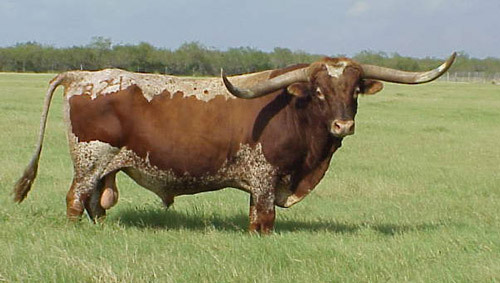 The Texas Longhorn is the living symbol of the Old West. They vary in color. An individual animal may have areas of black, gray, brown, and white. There are examples which are mono-colored, or have patches, spots or brindling. Very easy calving. The horns are impressively long and spreading.